There is a Wall Street axiom that says “90% of all the options that are bought and held to expiration will expire worthless”. This means that 90% of the time the people who ‘write’ the option and collect the premium, never get their stock ‘called’ from them or get stock ‘put’ to them. Whether the actual percentage is 90% or something lower is irrelevant to the evaluation of the Max-Pain™ effect. Option Pain, also known as Max Option Pain or Max Pain, is based on the theory that since most options buyers lose in options trading, the price of the underlying stock must be manipulated somehow to close during options expiration at a price that results in the most options contracts expiring out of the money. If the Option Pain theory holds, it becomes possible to actually predict the exact price a stock would close at during option expiration through charting the open interest of both call and put options. That exact price is known as “Option Pain” or “Max Pain”. 1. “Wealth transfer between option buyers and sellers is a zero-sum game”. This means both parties cannot gain or suffer together. In options trading, when one party wins, the other party loses. 2. “On option expiration days, the underlying stock price often moves toward a point that brings maximum loss to option buyers”. This means that on option expiration day, most option buyers with open positions loses money. 3. “calculated based on all outstanding options in the market”. This means that Open Interest is representative of the number of buyers of stock options. 4. “stock price manipulation target”. This means that stock prices can and are manipulated on option expiration days. 5. ” by the option selling group”. This means that a specialized group of traders exist that manipulates stock prices known as the Option Selling Group. After gathering all of the strike prices and open interest numbers for the April 2010 Nifty options, the next step is to compute the cumulative value of the open interest for both the puts and the calls assuming the Nifty closes at various prices. Here will assume that, at expiration, the Nifty closes at a value equal to each of the nineteen strike prices ranging from 4100 to 6000. The process is done for both the puts and the calls. If the Nifty closes on expiry at 4200, then only 4100 call is at the In the money(ITM) option.Then the value of all the in-the-money CALL options is Rs 17245000 [or (100 x 172450)]. This is the value of the options that will NOT expire worthless if the Nifty is at 4200 at expiration(Just an assumtion 🙂 ). From table we can see that the cumulative rupee value of the calls increases as the Nifty moves up in price, but the value of the puts declines as the Semiconductor HOLDRS moves higher. If the Nifty closes on expiry at 4300, then only 4100 call and 4200 is at the In the money(ITM) option.Then the value of all the in-the-money CALL options is Rs 35975000 [or (100 x 14850)] + (200*172450)]. If the Nifty closes on expiry at 4400, then only 4100,4200,4300 call is at the In the money(ITM) option and rest of the call expires worthless.Then the value of all the in-the-money CALL options is Rs 68365000 [or (100 x 19100)+ (200 x 14850)] + (300*172450)]. Finally after computing CALL Value,PUT Value. The next step in finding the point of maximum pain is to add the total value of the open interest for both the puts and calls across the various prices. In table , the total value appears in the last column. The point of maximum pain occurs where the total value is the least. At that level, the most puts AND the most calls will expire worthless, causing the most pain to option owners. In our example, 5300 represents the price of maximum pain. Stacked Chart is plotted i.e the sum of the PUT Value and the CALL Value. The point at which the most options expire worthless is labeled and is the point where the overall minimum value occurs (the Max-Pain Point™). It appears to be at the 5300 closing price point. How Should I Read the Call and Put Chart? This chart plots the total value of calls (blue) and puts (orange) separately. At a specific price point, if the call value is greater than the put value, the stock price may be manipulated below the strike price, making all call options worthless. If the put value is larger than the call value, the stock price may stop above the strike and make the put options worthless. What Should I Do if I Hold In-The-Money Options Near Expiration? You may want to sell the in-the-money option, call or put, one week before the final option expiration Thursday. If you hold these options to the last moment, very likely you will see your options become worthless. It has been proposed from some investment and options trading websites that stocks tend to move towards the Option Pain level as expiration hour approaches and is most predominant in high volume stocks (these are again claims that have yet to be rigorously tested or proven.). Essentially, if you know what price a stock will end up and when, there is almost an endless number of options trading strategies that you can use to take advantage of it. If the Option Pain level is higher than the stock price right now, you could use a Bull Call Spread by buying the At The Money call options and then sell the Out Of The Money call option slightly above or at the Option Pain price. Conversely, if the Option Pain level is lower than the stock price right now, you could use a Bear Put Spread using the same logic. Naked call write and put write at the strike price slightly above or below the Option Pain price works as well. Very interesting and thank you for all the effort you put in the calculations to arrive at 5300. Have you back tested your results and would you be kind enough to share your analysis. I have my doubts about this concept of Max Pain succeeding in our markets, as you know that options on the Nifty are sold much more than bought and being predominantly dominated by institutions, the ‘max pain’ calculations may be actually ‘max gain’ for them. I like to be proved wrong though, and wish for some more previous results. 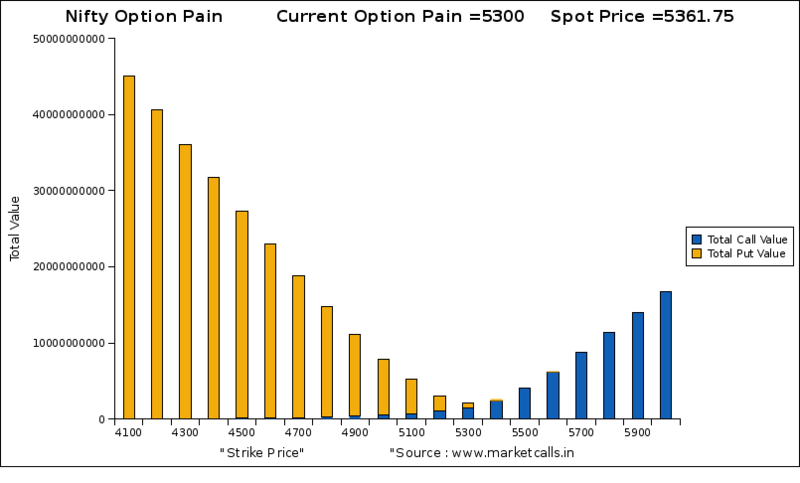 thanks rajendran for the informative article on options and the pain in the ***.every month one has to face trading options. after trading for a year in options i felt that i am making money a good amount in the first 2 weeks and losing big time in the last two weeks of a month. all the calls and puts that i buy are usually rocking , but due to the manipulation of option traders i miss out most of the time. i am only alive and kicking as i turn to hedging in the last week. however , thanks all the same. now can we take it one step further and prepare a simple excel sheet where we can calculate the options pain on a daily basis and find out the trend for high volume and operator active stocks. think about it and pls do send me a email. i could have done it myself but i do not know of any website which shows the value and open interest of option calls . can u help as the 2 weeks are over and i am looking at the 3rd week with some open positions. Wondeful. We have to keep on calculating everyday because the OI changes everyday.Finally it follows that the concept OI plays the role i.e. increase in price and increase in OI is Bullish etc. etc. Am I correct sir? The Option Pain Charts seem to be missing !! Any news on when they will be back again?? It will be very help ful to interprete and analyze. How do we calculate the put value or call value in option pain…i could not understand a bit..please help. How to find daily nifty option pain? Also how to found daily option pain for other F&O sripts? where can i get max pain chart? hi i read your post about max pain. I trying to create my own spread sheet in excel so i can back test this theory with old open interest data. Im have trouble to get the formula correct. Wandering what was the excel formula you used?